Winnipeg Office | Above average sales in October set the stage for a new annual sales record in Winnipeg. 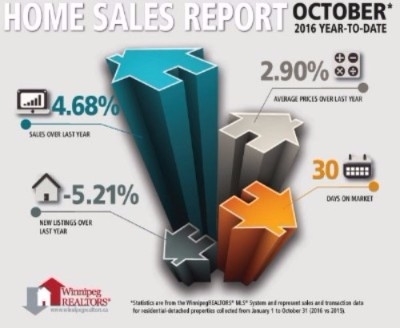 Above average sales in October set the stage for a new annual sales record in Winnipeg. October sales of 1,138 were up 5% over October 2015 and likewise over the 10-year average for this month. Year-to-date sales of over 12,000 are 7% ahead of the same period last year, and are well within reach of eclipsing the annual sales record set in 2007 of 13,079. First-time homebuyers not only make up a significant segment of any housing market but are instrumental in the ongoing home sales process. When they purchase their first home they provide current owners with the opportunity to upgrade or downsize leading to a cascade of more purchases all the way up the housing ladder continuum. The most active price range for residential-detached homes in October 2016 was from $250,000 to $299,999 at 23% of total sales. The lower price range of $200,000 to $249,999 was second busiest at 16%. The highest- price home sale was $1,375,000 and the lowest sale price was $39,000. The average days on market to sell a home was 33 days, 2 days faster than October 2015. 30% of condominium sales in October occurred in the $150,000 to $199,999 price range with another 17% happening in the $200,000 to $249,999 range. The highest-price condo sale was $975,000 and the lowest sale price was $88,000. The average days on market for condos was 47 days, the same pace as October 2015. If you would like to get into this hot and fast market, don't hesitate to call one of our specialists to talk about what option is best for you. Contact one of our experts at 3 Percent Realty Solution Winnipeg, to find out how we can save you thousands of dollars on your next real estate sale. This site's content is the responsibility of 3 Percent Realty Inc.